MINISTER FOR JUSTICE Alan Shatter has called on the Law Society and Bar Council to engage “constructively” with him in plans for major reform of the legal system. The Minister said that the Bill currently being debated in the Dáil to overhaul the legal services is based on the principle that “solicitors and barristers exist for their clients, not the other way round”. He described the planned reforms as a historic opportunity to make reforms which will benefit consumers. The Minister made the comments in an opinion piece for TheJournal.ie this evening. He was responding to an article by the head of the Law Society who had argued that the new Bill was a “blueprint for Government control of the legal profession”. 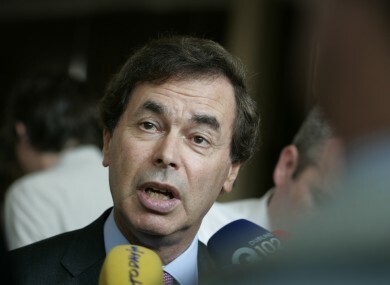 Shatter said that objections to the Legal Services Regulation Bill, currently before the Dáil, “are more theoretical than real”. The Bill is the first piece of legisation in the history of the State to articulate the principle of the independence of the legal profession, Shatter said. “The Bill is an opportunity to make a historically significant structural reform that puts consumers at its very heart,” the Minister for Justice said. Email “Shatter calls on legal system to engage "constructively" on law reform”. Feedback on “Shatter calls on legal system to engage "constructively" on law reform”.